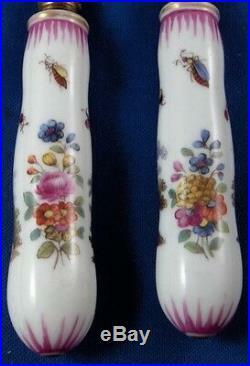 A rare knife and fork set made by Fuerstenberg in the early 19th century or maybe a bit earlier. Both pieces have handles made of porcelain that are hand painted with a scene of a couple in a landscape surrounding with some scattered small flowers and bugs plus a larger floral arrangement on the other side and a puce trim to the top and bottom ends. The metal parts are made of sterling silver and appear to be of British origin judging by the hallmarks and not original to the handles - they date to 1866 according to a helpful Ebayer. The pieces are in top condition with the silver tarnished a bit to look golden. 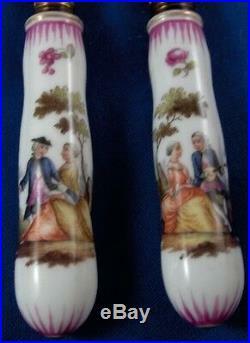 The handles are 3.375 inches long and 0.75 inches in diameter. The metal parts are 4.5 inches long for the fork and 5.25 inches long for the knife. They are not visibly marked though the style of painting is clearly Furstenberg. 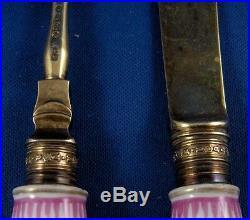 If you like my goodies have a look at my other auctions for a lot more top maker pieces like KPM , Sevres and so on. Photos are part of the description - if you need others just let me know exactly what you are looking for and I'll take care of it speedily! Please do not send me questions on items other than my own! The item "Antique Fuerstenberg Porcelain Knife & Fork Porzellan Messer & Gabel Furstenberg" is in sale since Friday, August 31, 2018.